Opal is the flower child of Oregon literature. This charismatic and beautiful young woman lived in a southern Oregon logging community at the turn of the century. About the age of 6, she began writing a mystical and realistic diary. In the diary she described her home, her animal friends, the landscape of cathedral trees and a singing creek. The diary was a full-fledged book complete with phonetic spelling, crayon drawings and scraps of colored paper. Early entries were written with childish clumsiness while later entries became polished prose. The little girl was a genius! Or was she? As an adult in Boston, trying to sell a manuscript, Opal was asked by Atlantic Monthly editor Ellery Sedgewick if she had a diary. She did! But it was in pieces and needed to be assembled. She had it sent to Sedgewick loose in hat boxes containing 1/2 million pieces of paper. Opal assembled it. In 1920, The Story of Opal: The Journal of an Understanding Heart was serialized by the Atlantic Monthly. It became an instant best-seller. She was lionized as a fairy princess, intuitively in touch with nature and all its creatures. Including angel parents descended directly from the French Bourbon throne. Opal Whiteley became an international sensation. Was she an adopted child as she claimed? The Whiteley parents were upset and worried about her mental health. Critics asked how could a little girl know French, be so philosophical and literary? She named animal friends after characters in classical literature: Lars Porsena - the crow; Brave Horatio - the dog; and Thomas Chatterton Jupiter Zeus - the wood rat. Skeptics called the diary a hoax. Opal Whiteley's promising, even brilliant, career was soon on the wane. What was the true story behind Opal and her writing? Benjamin Hoff traveled halfway around the world unraveling Opal's hidden story. Hoff (whose books The Tao of Pooh and The Te of Piglet have been on the NY Times best sellers list) went to Boston to research the original diary scraps. In London, he visited the Napsbury Hospital for the mentally ill. (In 1984, Opal was virtually entrapped there, incognito and unable to speak for herself). Hoff spoke with Opal's doctor who claimed she was in too delicate a condition to be seen. Opal's story is stranger than fiction. What a film this would make! 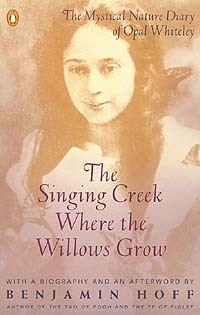 The Singing Creek Where the Willows Grow (1986) published by Ticknor & Fields, is absolutely fascinating. The model for bringing back the work of any forgotten and neglected writer from a bygone era. His carefully researched 60 page introduction suggests that the diary is authentic but that Opal suffered from "a gift" of genius and schizophrenia. Recently, Jane Boulton re-issued Opal, The Journal of an Understanding Heart (1995, Crown Trade paperback). In poetry form, this is a lovely version of the Opal story, which teaches us to revere the magic child within. Its afterword gives new information on Opal Whiteley and confirms her death in February 1991. So there are many ways to access "the Opal Diary". Steve McQuiddy has a wonderful overview: The Fantastic Tale of Opal Whiteley. Steve tells the amazing story with clarity and style. Steve Williamson, has created a terrific Opal Whiteley home pages in Cottage Grove. Cottage Grove has a park and a festival in her honor. Be sure to check out Steve's fascinating work! He was in Portland in March, 1999. Steve Williamson's insights both as a mental health professional and as a fan of Opal Whiteley's extraordinary life and work are riveting. A brand new digital edition of Opal's Diary is now available on-line. This remarkable project by the University of Oregon features pictures and maps of woods where Opal roamed, a biography, definitions and lots more. It is being developed at U of O's Center for Advanced Technology in Education (CATE) as a part of Project Intersect. The following selections are from the original 1920 edition. ...The baby-it is a beautiful baby-though it does have much redness of face from coming such a long way in the cold last night. Maybe it was the coldness of the night that did cause the angels to make the mistake. They stopped at the wrong house. I'm quite sure this is the very baby I have been praying for the angels to bring to the new young folks that do live by the mill by the far woods. Dear Love, her young husband does call her. And they are so happy. But they have been married seven whole months and haven't got a baby yet. Twice every day for a time long I have been praying prayers for the angels to bring them one real soon. And most all day today I did feel I better tell Elsie as how this baby isn't her baby, before she does get too fond of it.